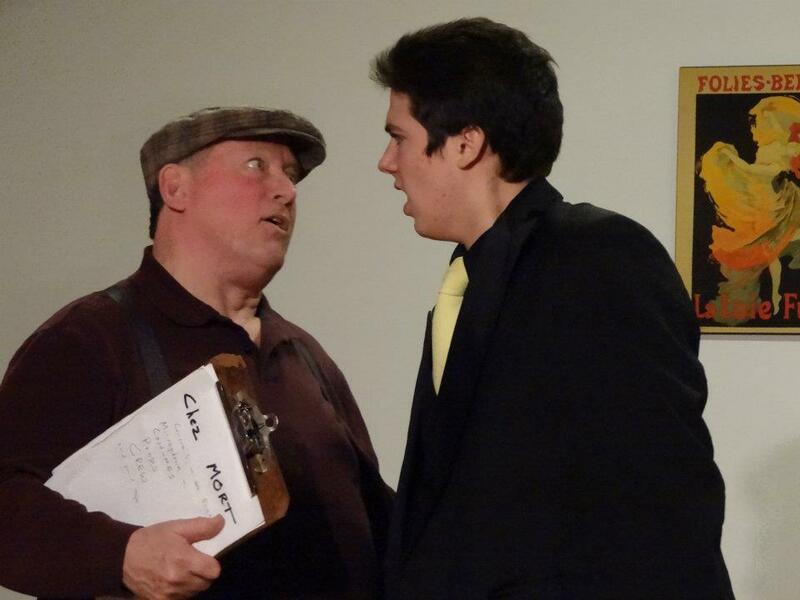 The Thunderbolt Players, a troupe of student actors at Evansville’s New Tech Institute, will serve food, comedy and suspense in “Murder Me Always,” a murder mystery playing March 2 and 3. They’ll throw in a silent auction, as well, in performances staged to raise money for equipment, materials and activities at the project-based high school housed in the Southern Indiana Career and Technical Center, 1901 Lynch Road. Doors will open at 5:30 p.m., March 2, for the dinner theater event. And the hall will open at 2 p.m., March 3, for the high tea show. Tickets are $12.50, available at the New Tech Institute School office, by email at ntiplayers@yahoo.com, or by calling 812-303-1658. he deadline for reservations is Monday, Feb. 27. 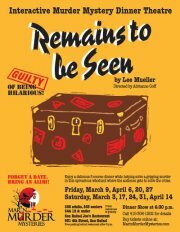 Marin Murder Mysteries Presents 'REMAINS TO BE SEEN' written by Lee Mueller and directed by Adrianne Goff. Enjoy a delicious five-course dinner while helping solve a gripping murder! San Rafael Joe's exposed brick back room, evocative of the 1950s, lends itself perfectly to this murder mystery. "Remains to be Seen" begins with a "Rod Sterling" type character introducing deadly details of a murder mystery about a dead body discovered in a steamer trunk. A talented troupe (evoking famous characters from stage and screen) collaborates with the audience to unravel the clues to determine the motive and reveal those responsible. Show includes sets, props, costumes, surprises and special effects, plus fun game prizes for astute audience detectives. Affton CenterStage (my home troupe) is presenting the first ever staging of my new play "Last Call At Chez Mort" Feb 24th and 25th. Set in the 1940's at European style Supper Club "Chez Mort". It recounts the tale of an unusual crime in the Swing Era time. As newspapers of the day reported: "Ingenue 'Sweet Sue' Blutowsky was mysteriously and fatally cut short during her debut singing performance. What it an accident? Or something a bit more sinister? Inspector Eddie Constantine, a crusty old detective was quick on the scene to investigate the strange circumstances surrounding the shocking events. In attendance that night was the infamous hoodlum Big Suit Stu and his foreign henchman. But was the gangster the culprit? Or maybe one of the other mugs, such as gentle French Master of Ceremonies Jean-Paul Truffaut or hard boiled, street wise Stage Manager Mack? Or would the plot twist and turn until our good Inspector doesn't know which way to turn? Well, probably. I mean, I wrote it!